MONTREAL -- So many asylum seekers are crossing into Canada from the United States that Montreal's Olympic Stadium has been opened to house them. The first groups were bused to the stadium Wednesday. Cots are set up in the windowless, domed facility. The mainly Haitian migrants will stay until they get government financial assistance. Francine Dupuis, head of a Quebec government-funded program that helps asylum seekers, said a maximum of 450 people will be housed temporarily. She said her organization helped 448 people in June and 1,174 in July, far more than previously. "We are really stretched, really stretched," Dupuis said. "It's much more than we have ever seen." Ninety percent are Haitians. The U.S. is weighing ending a program that granted Haitians "temporary protected status" after Haiti's 2010 devastating earthquake. If the program isn't extended, as many as 60,000 Haitians in the United States could be sent back to their homeland. "They think the Trump administration will fly them back to Haiti and they don't want to take a chance," Dupuis said. Dupuis said the YMCA and shelters are already full. She said the stadium has agreed to house up to 450 people for a few months but can't take more because they have other activities at the stadium. She said her organization had usually been able to deal with an influx of migrants but the numbers now are unprecedented. Volunteers from the Quebec Red Cross helped set up the cavernous, concrete stadium for a temporary stay with cots and food in the rotunda. The stadium was the main venue of the 1976 Olympics. It has not had a main tenant since the Montreal Expos left in 2004. Guillaume Andre, a Montreal community worker, said he has helped some people who have arrived previously from the United States. 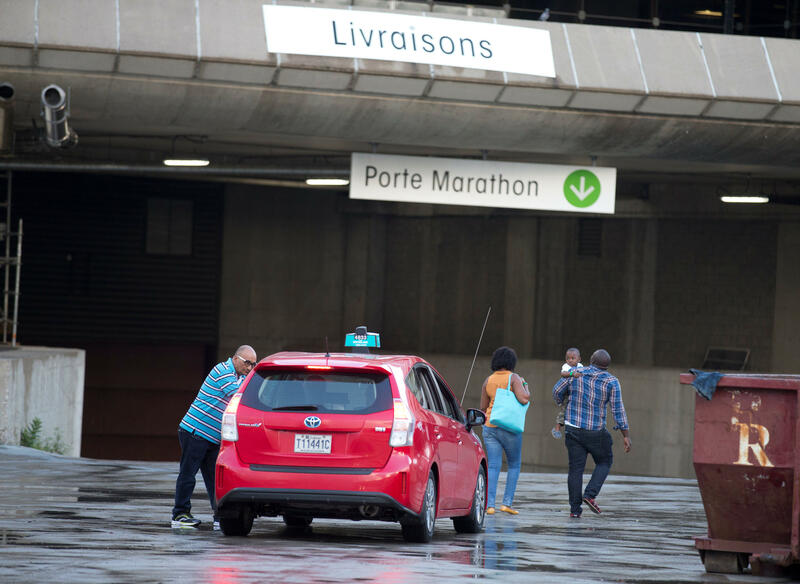 "Some of them have parents here, friends here, who can help them," said Andre, one of several Haitian-Montrealers who welcomed the new arrivals at Olympic Stadium. Mayor Denis Coderre, an outspoken critic of the U.S. administration's immigration policies, went on Twitter to welcome Haitian arrivals and tell them they can count on the city. Montreal has a large Haitian community. Coderre later tweeted that there were 2,500 new arrivals in Quebec via the United States in July, with as many as 500 currently held at St-Bernard-de-Lacolle on the Quebec-New York State border. Jean-Pierre Fortin, president of the union representing Canada Border Services Agency border guards, said 500 people crossed illegally on Tuesday alone as he and a CBSA manager visited Roxham Road in Hemmingford, a popular crossing for asylum seekers since last November. "The numbers have exploded in the last week and a half," Fortin said.